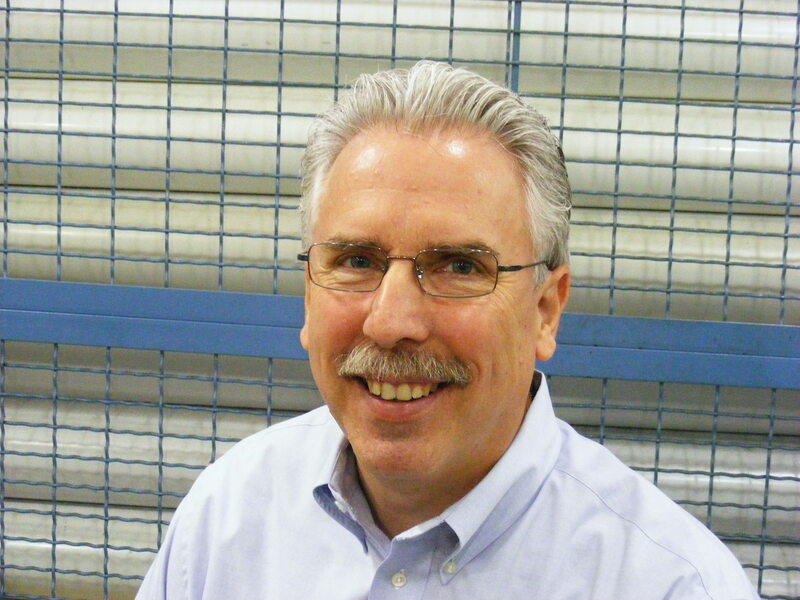 When I was a blast furnace burden clerk at USS back in the 1970’s, the hot metal production that I reported was the CEO’s critical indicator for the Company. He knew that he couldn’t possibly track every product and process in the far flung USS empire. However, he did know that he couldn’t get more finished steel production out of his company than was originally produced as hot metal in the blast furnaces. So blast furnace production was the single most important production indicator that was used to manage the business. 2010 remains above 2009 and 2008 data. Rail shipments are an equally valid indicator to those of us in manufacturing- raw materials such as iron ore, semi finished products such as steel, and finished goods such as motor vehicles are all a component of the Monthly Carload Report compiled by the Association of American Railroads. U.S. freight railroads originated an average of 284,407 carloads per week in November 2010, for a total of 1,137,626 carloads for the month. That’s up 4.5% over November 2009. 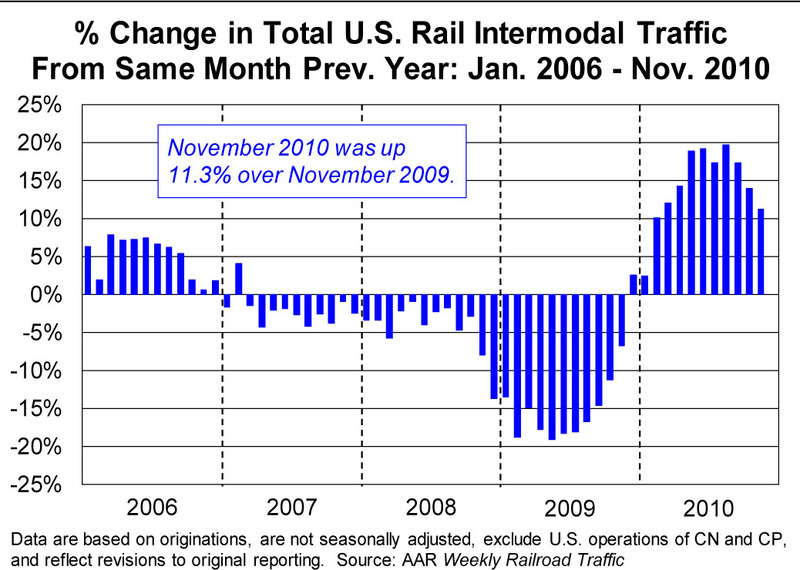 Year-to-date carloads the end of November 2010 were 13.46 million, up 7.1% from the 12.57 million through same time period in 2009. 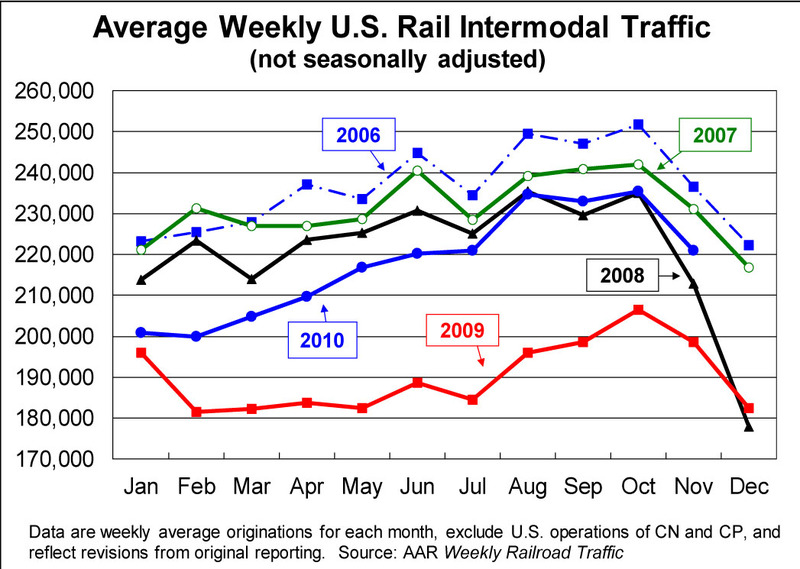 November 2010 was the ninth straight month with higher year-over-year average weekly rail carloads something that hasn’t happened since 2004. I like where we are! Waste and Scrap (largely scrap) up 11.4%. There are a lot of conflicting and confusing indicators being circulated in the media today. We continue to be a fan of rail shipments as an indicator of the real status of the ‘Tangible Economy’ of manufacturing. Just like the iron production numbers I helped track back in the day, These rail shipments are a great proxy for manufacturing to come (ore and scrap shipments) and present manufacturing (Motor vehicle and parts shipments) as well as a proxy for the larger economy that is built of the ‘stuff’ carried by rail. This entry was posted on Tuesday, December 14th, 2010 at 12:12 pm and is filed under Front Office. You can follow any responses to this entry through the RSS 2.0 feed. You can leave a response, or trackback from your own site. Do you think so, or do you think it is seasonality? These are NOT Normal times.Thanks for sharing your comment Phil.